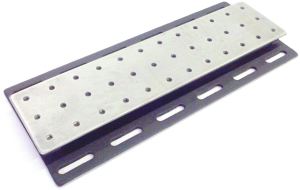 These are small honeycomb breadboards with (2) flanges on the bottom plate for easy mounting. The top surface has an array of 1/4-20 tapped holes and the bottom flanges have .280” x 1.3” slots. Top / Bottom material is Ferromagnetic Steel-Black Polyurethane Coated (FMP). Photo is of similar style unit.